This free WMA audio cutter and editor is an extremely simple and handy tool for routine WMA editing tasks such as cutting, volume changing, etc. The program displays a waveform graph that lets you easily select a portion of the WMA for editing. Kari is a virtual girlfriend simulation with the latest Artificial Intelligence. KARI was designed from the ground up to be your companion and friend. Good if you are looking for a romance, a friend to sit by, or simply someone to talk to. AnyMP4 DVD Copy enables you to free copy/clone home-made DVD disc/folder to DVD disc/folder or ISO files with 1:1 ratio. It also allows you to backup home-made 2D/3D DVD content to DVD disc/hard drive as DVD folder or ISO image files. Bigasoft BlackBerry Ringtone Maker helps you to convert MP3, AVI, MPEG, WMV, DivX, MP4, H.264/AVC, AVCHD, MKV, RM, MOV, XviD, 3GP, WMA, WAV, RA, M4A, etc. to BlackBerry ringtones MP3, and transfer the unique ringtones to your BlackBerry smartphone. Keep your PC operating smoothly by using Registry Cleaner to scan, identify, clean and repair errors in your Windows Registry with a single click. honeRescue for Android is an ultimate data recovery tool designed for recovering your lost messages, photos, contacts, call logs, etc. on your Android phones and tablets. Whether you mistakenly deleted or accidentally lost anything important to you, it helps you get them back with the highest recovery success rate. More than a data recovery tool, PhoneRescue for Android is a safe box which protects everything that matters to you from disappearing. 1. Focused on helping recover data & files from your Android phone/tablet with the highest success rate. 2. Recover lost/deleted messages, contacts, call logs, calendars, etc. directly to your Android device for instant use. 3. Cover all Android phone/tablet running Android OS 4.0 and above, including SAMSUNG, HUAWEI, SONY, HTC, Google, LG, MOTOROLA, OnePlus, and more. 4. Scan and pinpoint your lost-but-valued content in the first moment from your Android device without root, and conjure them back in an eye-blink. 5. 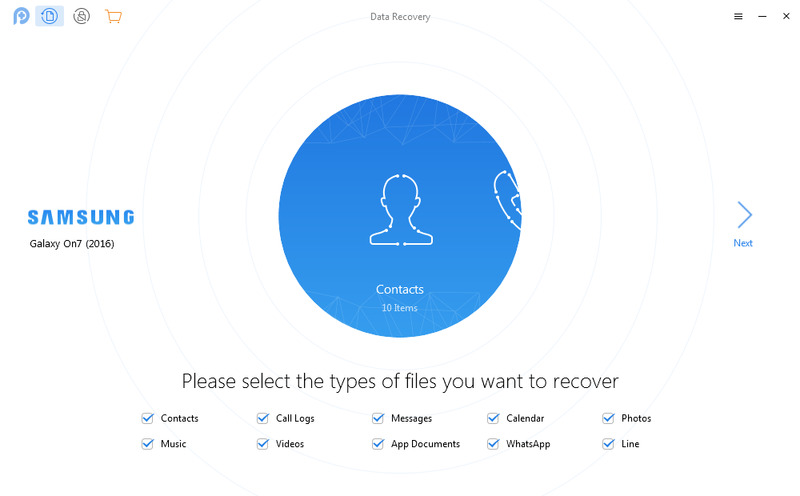 Recover up to 13 types of the most commonly used data, including messages, photos, contacts, even WhatsApp and Line chatting records & attachments, etc. 6. Get back lost/deleted content with several simple clicks, no extra complex steps. 7. Help unlock your screen when forgetting the screen lock password, and keep all data intact on your Android device. #1.Updated to retrieve lost data from all Android device types, including SAMSUNG, Google, SONY, HUAWEI, LG, MOTOROLA, Lenovo, Xiaomi, etc. #2.Optimized the Android device connection issue. #3.Fixed some minor bugs.